My wife, kids, and I were in Southern California earlier this summer on a week-long family vacation. We drove down Sunday afternoon, spending our first night in Hollywood. We stayed at the Hollywood Motel Six - which we were happy with. It's not deluxe, but did the job - especially as we were on a budget. This is the view from our room looking out over Hollywood early Monday morning. 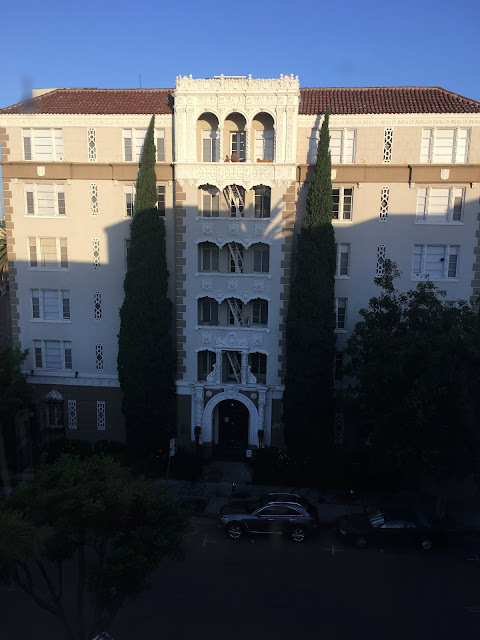 Across the street, the historic La Leyenda (Spanish for "the legend") apartment building, built in 1927. One of the highlights (in my opinion) of Hollywood is it's historic buildings, most of which were built in the 1920's. A 580 square foot studio at La Leyenda starts at $1525. This is looking down Whitley Avenue, looking south toward Hollywood Boulevard. We were on the road a little after 7am. Unlike the crowds and general craziness the day before, Hollywood Boulevard was incredibly quiet. Approaching the intersection of Hollywood Boulevard and Highland Avenue. The Museum of Broken Relationships (yes, that's really a place) is immediately to the right, the tower of the Hollywood First National Bank Building. We stopped by McDonald's for a quick (and cheap) "to go" breakfast, and then headed up Highland Avenue. This is at the corner of Hollywood Boulevard, to the left the Hollywood & Highland entertainment complex, to the right the Hollywood First National Bank Building. Highland Avenue becomes Cahuenga Boulevard. We passed by the Hollywood Bowl. We had a chance to go here several times when we lived in Los Angeles. Our destination: Universal Studios Hollywood. Drops of blood from the Jurassic Park T-Rex (in the parking structure) should be a good hint that Universal is not designed for families with younger children. 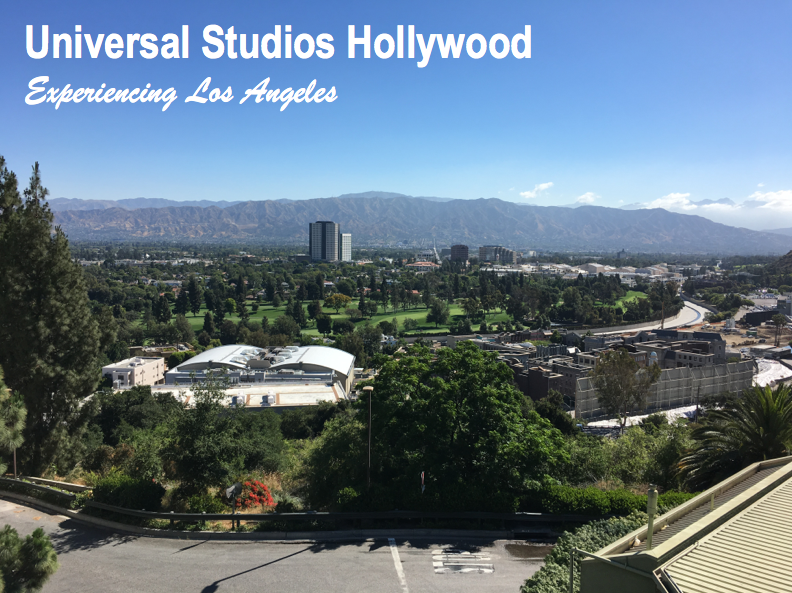 We visited Universal Studios Hollywood for the first time in January. 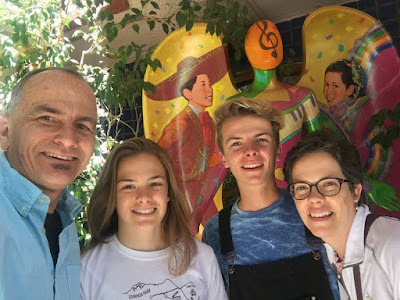 Here's a link to a post on our experience. If we could summarize previous visit in one word it would be disappointing. So why go back? Well, the folks are Universal aren't stupid. Back in January we paid an extra $19 per person when we bought the tickets for "California Neighbor Pass." We figured, it wasn't that much more and we could all go at least one more time, so why not? That said, we decided to give Universal Studios another try. 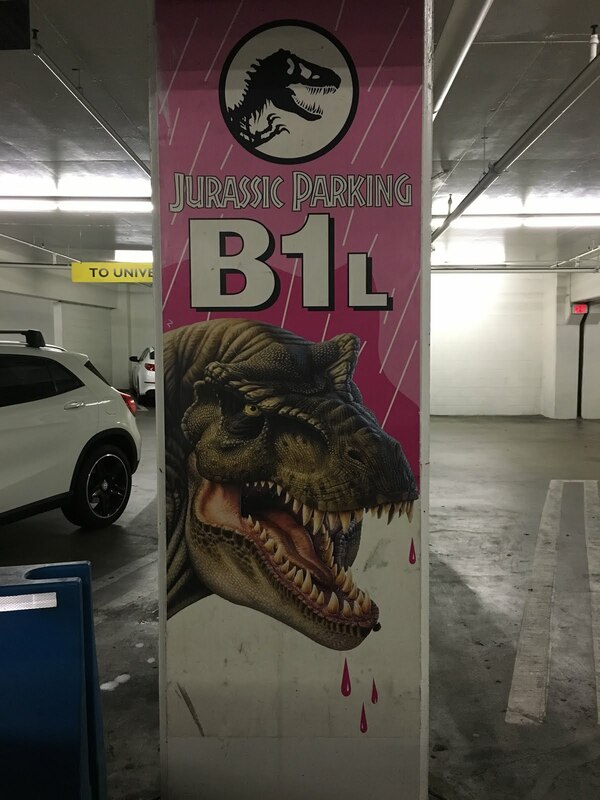 Aside from parking, we'd already paid for it, so it wasn't going to cost anything. 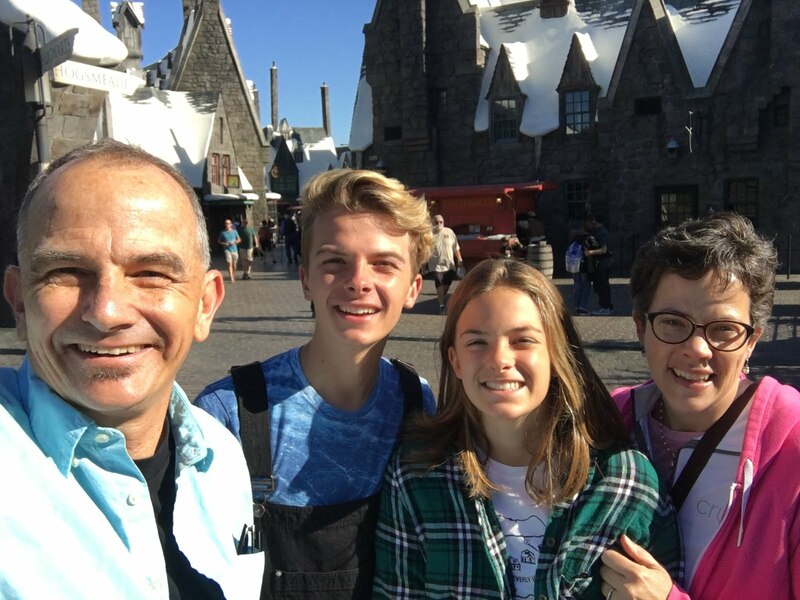 First stop: The Wizarding World of Harry Potter. Both at Universal Studios Orlando and Universal Studios Hollywood, they've done a good job recreating the village of Hogsmeade featured in the books and movies. Their signature ride is Harry Potter and the Forbidden Journey. It broke down last time - making for one of the worst experiences I've ever had on any amusement park ride. Fortunately, no problems this time. This section of Universal opens at 8am, with almost no lines. If you do decide to go, like any amusement park, GO EARLY. Apparently, the line to this one rides becomes 2-3 hours later in the day. Took the studio tour - again. Kind of the same old, same old. But it was nicer seeing in early summer. One of one the New York City sets. 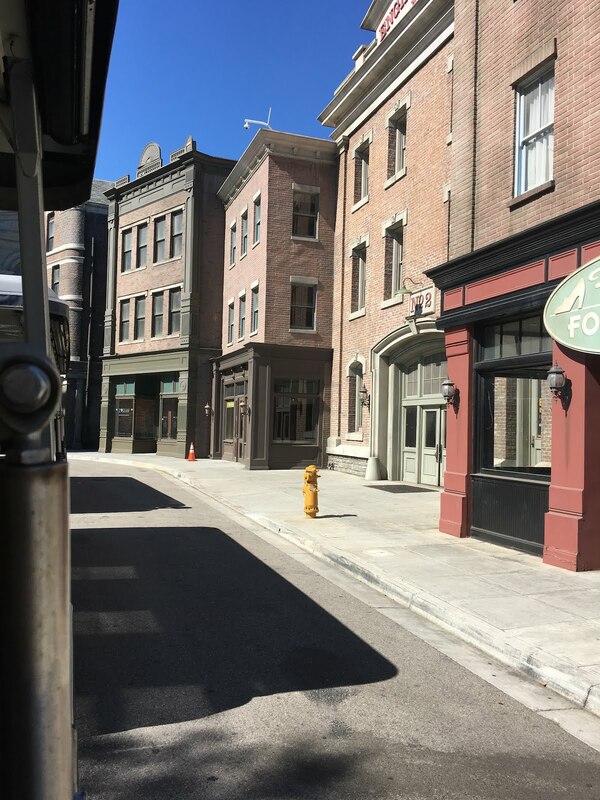 The small blue bus towards the back is for the VIP tour, which costs significantly more, but allows you to walk around the sets a bit. When our family lived in Los Angeles, my wife and I took the much smaller, but much more interesting Warner Brothers Studio Tour. We were in a group of about 15, were able to get out and walk around, and really got an amazing behind the scenes look of how a working motion picture works. 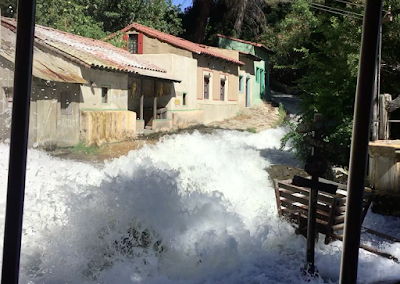 The Warner Brothers Studios Tour is $65. The cost of the Universal VIP tour is $329. That's over $1300 for a family of four for a one day experience. Yikes. The flash flood is a mildly entertaining part of the Studio Tour. For some reason, it wasn't working last January, so it was nice for my kids to see it. I was never of a fan of the destroyed 747 from Steven Spielberg's 2005 film War of the Worlds. Part of the tour features stopping and viewing the wreckage of a destroyed airplane. The tour is "just OK" ... both the King Kong and the Fast and Furious segments of the tour are very cheesy 3D film clips. My teenage kids (their supposed target audience) thought they were both awful - ESPECIALLY the Fast and Furious. Unlike Universal Studios in Orlando, Universal Studios Hollywood is a real movie studio in the middle of a major city. Meaning space is at a premium. Hence, Harry Potter is jammed up again downtown Springfield in the Simpson's section. The Waterworld Stunt Show was closed last January - during the Christmas/New Year's vacation. What were they thinking? They closed their most popular show during the busiest time of the year? You can read my rant here. Fortunately, it was open when we were there in June. Spoiler alert: here's a 50 second clip I took, with probably the best part of the show. Skip over it if you want to be surprised. Lots of explosions - but overall my teenagers weren't into it. We walked down to the "Lower Lot" section of the park and rode. the Mummy Ride, the Jurassic Park ride. We headed back to the "Upper Lot" stopped in the gift shop (above) and were ready to leave, all by 11:30am. We had very low expectations. We went on a total of four rides, did the studio tour, and saw the Waterworld show. After 3 1/2 hours we were done. 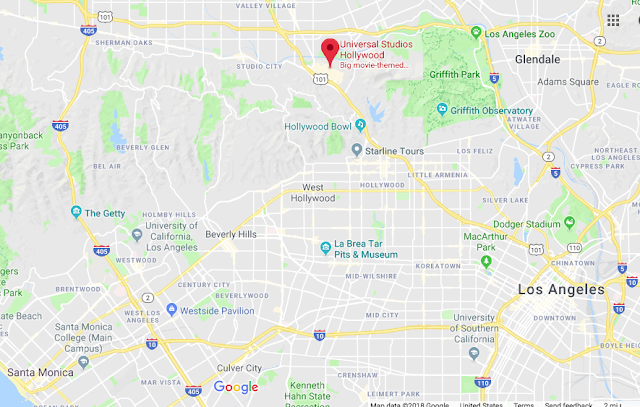 So, is Universal Studios worth $110 per person, or $129 for their "California Neighbor Pass"? If you're going to spend money at an amusement park, I'd recommend Disneyland, Knott's Berry Farm, or Six Flags Magic Mountain. Even at day at the Santa Monica Pier would be a better value. As I said last time: Universal simply has too movies and intellectual properties we could care less about. Way too many motion simulators - way too few actual rides. Plus, I would have a hard time recommending Universal Studios to anyone with kids under age 12. Too intense. Too scary. Too inappropriate. Too "adult." 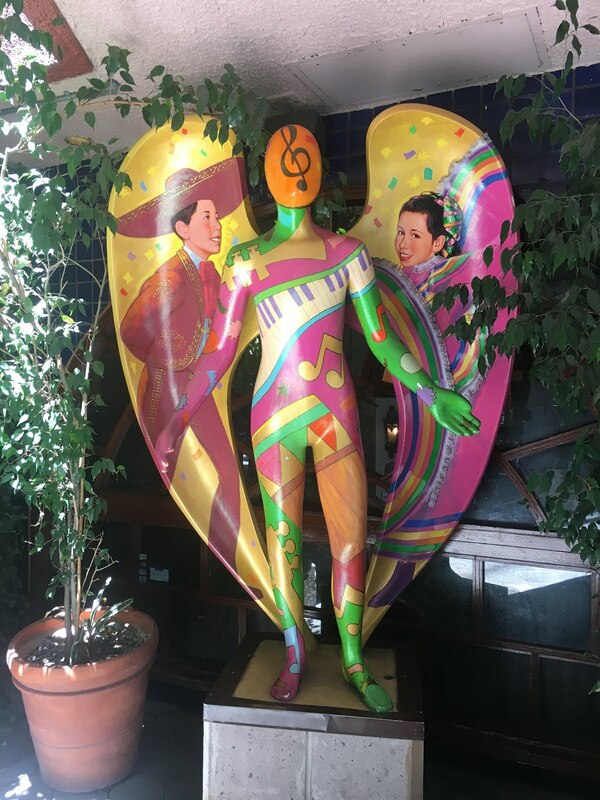 In October of 2000 four hundred painted fiberglass angels were displayed in public places throughout the city of Los Angeles. They were on display for about six months, and then auctioned off to benefit a couple of local charities. One of them was in front of the Mexican Restaurant in the CityWalk section of Universal, on the way to the parking garage. I LOVE this artwork. Here's a link to a previous post on the "Community of Angels" display, with some additional highlight photos. Ironically, my favorite part of Universal Studios was a piece of sculpture outside the studio gates. That's OK. Sorry, Universal - no plans on going back to visit ever again. 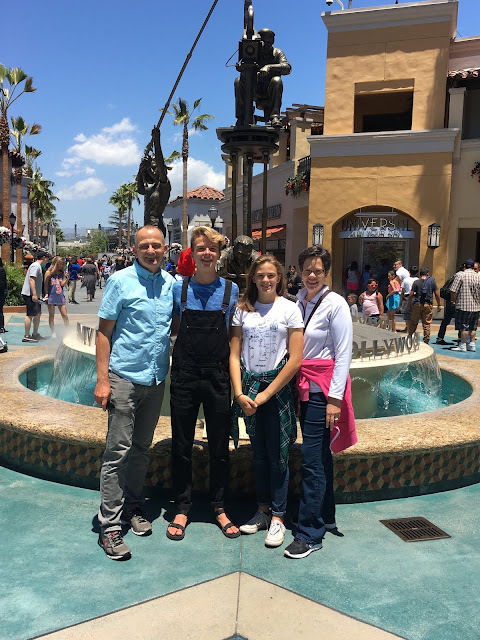 We were heading down to Orange County, and spending three nights at a timeshare in Newport Beach, and then finishing the week off at Disneyland. I'll post a few photos on sometime later.